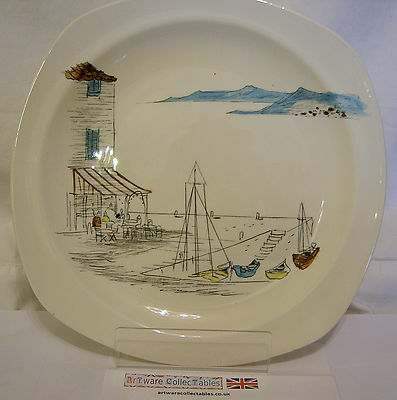 An excellent opportunity to acquire up to 5 Riviera design plates manufactured by the Midwinter Pottery. This plate measures just about 7.75 inches (19 cms) in length with a similar width and is in perfect condition. Of the 5 plates I currently hold in stock, 2 have some crazing and 1 has small underglaze marks in one corner; otherwise, overall, they are in excellent condition. I would be willing to discuss an overall cost for any number should any buyer be interested in 6 pieces. Otherwise, I shall sell as individual plates as and when.